Passer domesticus (the house sparrow) is a small bird, native to Eurasia and northern Africa, that was intentionally introduced to the Americas. Passer domesticus are non-migratory birds that are often closely associated with human populations and are found in highest abundance in agricultural, suburban and urban areas. They tend to avoid woodlands, forests, grasslands and deserts. Particularly high densities of Passer domesticus were found where urban settlements meet agricultural areas. They may evict native birds from their nests and out-compete them for trophic resources. 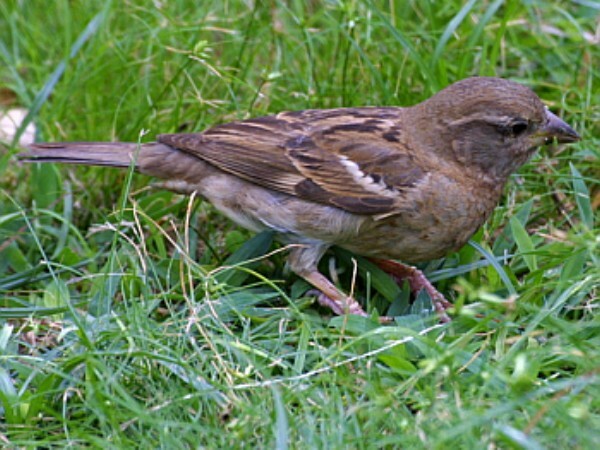 Early in its invasion of North America, Passer domesticus began attacking ripening grains on farmland and was considered a serious agricultural pest. Recent surveys indicate populations are declining. The male house sparrow (Passer domesticus) has a brown back with black streaks. The top of the crown is grey, but the sides of the crown and nape are chestnut red. The chin, throat and upper breast are black and the cheeks are white. Females and juveniles are less colourful. They have a grey-brown crown and a light brown or buff eye stripe. The throat, breast and belly are greyish-brown and unstreaked (Cornell Lab of Ornithology, 2007). 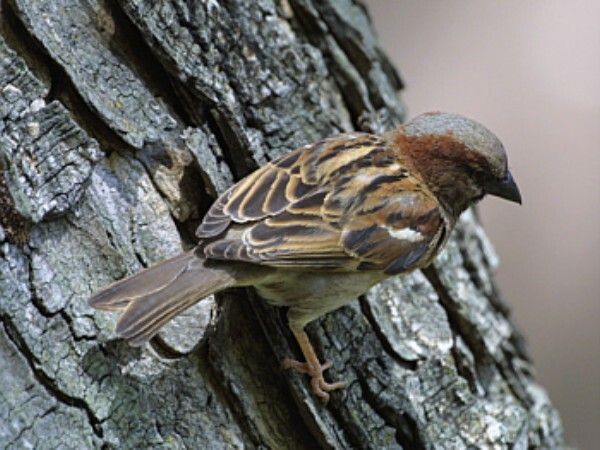 The house sparrow (Passer domesticus) has been commended for feeding on insect species considered pests, such as moths, cabbage worms, and cotton caterpillars (Burleigh 1958, Sprunt and Chamberlain 1970, in Aguirre and Poss, 2000). 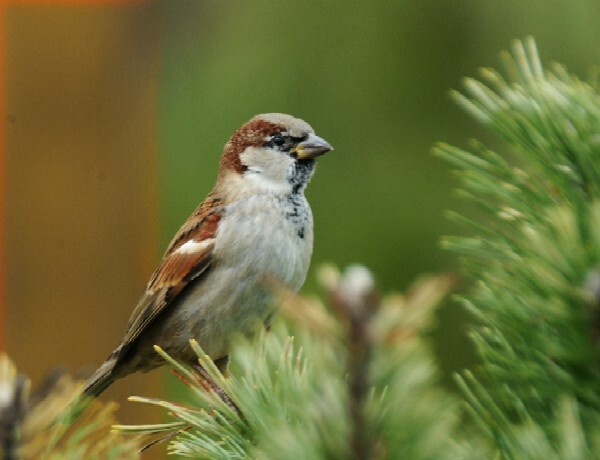 House sparrows (Passer domesticus) may evict native birds from their nests and out-compete them for trophic resources. For the most part, P. domesticus is always found around man-made structures and lives around cities, towns and farms. It is non-migratory. Along the Gulf coast of North America it is found in salt marsh scrub in disturbed areas (Toups and Jackson 1987, in Aguirre and Poss, 2000). Foraging habitat includes fields and agricultural areas (Aguirre and Poss, 2000). House sparrow (Passer domesticus) nests are built from dried vegetation, feathers, string and paper. Eggs are laid at any time in the nesting period. One to eight eggs can be present in a clutch, with the possibility of four clutches per nesting season. Incubation begins after all the eggs have been laid. Both males and females incubate the eggs for short periods of a few minutes each. Incubation lasts for 10 to 14 days. House sparrow (Passer domesticus) diet consists mostly of weed and grass seeds, grains and insects. Where available, it also feeds on cultivated grains, fruits and vegetables. Although it forages mostly on the ground in open areas, P. domesticus will perch on weed stalks to take seeds and search tree barks for insects. In urban areas, garbage constitutes a significant part of the birds diet and the consumption of grains by urban birds is less significant than in rural areas (D. Summers-Smith, 1963). The house sparrows (Passer domesticus) association with human beings has been in large part responsible for its successful invasion of North America (Aguirre and Poss, 2000). Review: Dr. Andras Liker Department of Zoology, University of Veszpr�m. Veszpr�m Hungary. Recommended citation: Global Invasive Species Database (2019) Species profile: Passer domesticus. Downloaded from http://www.iucngisd.org/gisd/species.php?sc=420 on 19-04-2019. Despite their small size, house sparrows (Passer domesticus) are quite aggressive. 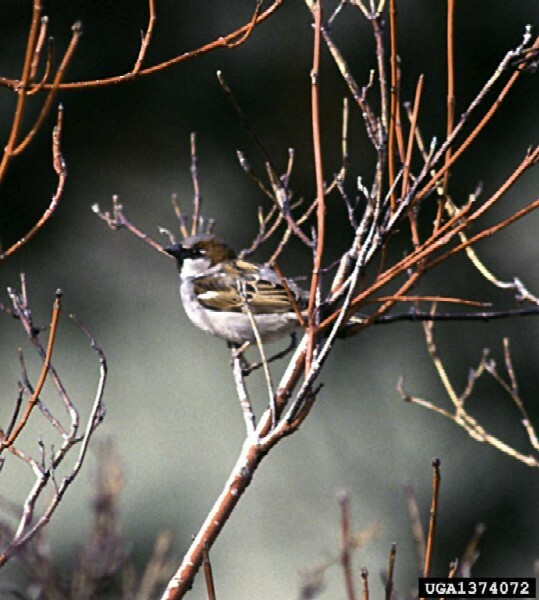 House sparrows are known for displacing native species through competition by out-competing them for trophic resources. In rural areas they may evict native birds from their nests. Some species reported as being driven away by P. domesticus include the bluebird and the Carolina wren, as well as a variety of woodpeckers and martins. Early in its invasion of North America, P. domesticus began eating ripening grains, such as wheat, oats, corn, barley and sorghum, and was considered a serious agricultural pest. Peas, turnips, cabbage and nearly all young vegetables are also attacked, as well as apples, cherries, grapes, peaches, plums, pears, strawberries and raspberries. Additionally, P. domesticus are a pest on poultry farms where they can consume large quantities of chicken feed. Preventative measures: The Bureau of Rural Sciences, Australia, recently developed a risk assessment model (Bomford, \r\r\n2003) which has been endorsed by the National Vertebrate Pests Committee and may be used as the basis for future exotic species import applications. To assign an exotic species to a threat category, three risk scores are calculated: the risk that (1) an escaped or released individual would harm people, (2) escaped or \r\r\nreleased individuals would establish a wild free-living population (3) the species would be a pest if a wild population did establish. These three risk scores are then \r\r\nused to assign the exotic species to one of four threat categories: extreme, serious, moderate or low. Passer domesticus has been assigned an \r\r\nExtreme threat catergory for Australia. These animals should not be allowed to enter, nor be kept in any State or Territory. (Special consideration may be \r\r\ngiven to scientific institutions on a case by case basis.) Any species that has not been assessed previously should be considered to be in the Extreme Threat Category \r\r\nand should be treated accordingly, until a risk assessment is conducted. Physical: According to Glacking (2000), there are several ways to control P. domesticus and prevent sparrow problems. One is habitat modification. Roosting and nesting sites can be reduced by blocking entrances larger than 2cm. Buildings can be designed or altered to eliminate resting places. In some areas, building codes are modified and architectural committees review plans to reduce nesting sites. Food sources can be reduced by removing edible human refuse, protecting small crops with bird netting and practicing clean livestock feeding techniques. Feed also needs to be covered to protect it from bird droppings. Bird-resistant varieties of plants can be planted. \r\nMore direct methods of control include shooting, trapping, poisoning and repelling. House sparrows can be shot with air guns and small arms containing BB's and dust shot. Trap types include funnel, automatic, triggered and mist nets. Trapping is generally difficult, as sparrows quickly learn to avoid traps, nets, etc. (Summers-Smith, 1963). P. domesticus can be repelled with noise, such as fireworks or alarms. Bird glues and Nixalite (trademark for \"porcupine wire\") annoy the sparrows. They can also be scared away with scarecrows and motorised hawks. Destroying nests can be another method of reducing P. domesticus populations. \r\nChemical: The standard poison used is Avitrol (trademark for 4-Aminopyridine). It is most effective in winter, when food is scarce and bait is readily accepted. Grain is typically used, however, it is important to be aware of any local poison control laws before proceeding. Naphthalene is an olfactory repellent. Informations on Passer domesticus has been recorded for the following locations. Click on the name for additional informations. Summary: This paper summarizes the different steps of a decision-making protocol applied to the recent establishment of an exotic species, the House Sparrow Passer domesticus, in the Lesser Antilles. Glacking, J. 2000. English or House Sparrow. Lasting Forests. Summary: A report on management of P. domesticus. Summary: Information on nesting habits and management. Aguirre, W., Poss,S. 2000.Passer domesticus. University of Southern Mississippi. Summary: A detailed report on P. domesticus. Available from: http://www.gsmfc.org/nis/nis/Passer_domesticus.html [Accessed 20 July 2003]. Avibase, 2008 - listes d oiseaux mondiales. Guyane fran�aise. Summary: The Biodiversity & Environmental Resource Data System (BERDS) is a comprehensive biodiversity and environmental data warehouse and research system built with one purpose - to enhance collaborative research and conservation efforts in Belize by providing shared access to not only accurate biodiversity- and environment-related data but also the tools necessary to begin research and investigation of that shared data. Gough, G., Sauer, J., Iliff, M. 1998.Patuxent Bird Identification Infocenter. Patuxent Wildlife Research Center. Summary: A short description of P. domesticus and similar species. Summary: Notes on distribution and spread. Levesque, A., Clergeau, P. 2002. First colonization of the Lesser Antilles by the House Sparrow Passer domesticus. El Pitirre, 15, 73 � 74. Summary: Base de donn�es sur le patrimoine naturel fran�ais. Summary: General Information, Notes on similar species. Summary: A map of P. domesticus summer distribution in the USA and Canada. The Birdhouse Network (TBN). 2001. House Sparrow Cornell Lab of Ornithology.